Austrian physician; born at Nikolsburg, Moravia, Sept. 20, 1844. He attended the gymnasium in his native city, and studied medicine at the University of Vienna, where he completed his course in 1870. The following year he received the degree of doctor of medicine, and one year later that of doctor of surgery, both conferred by the University of Vienna. 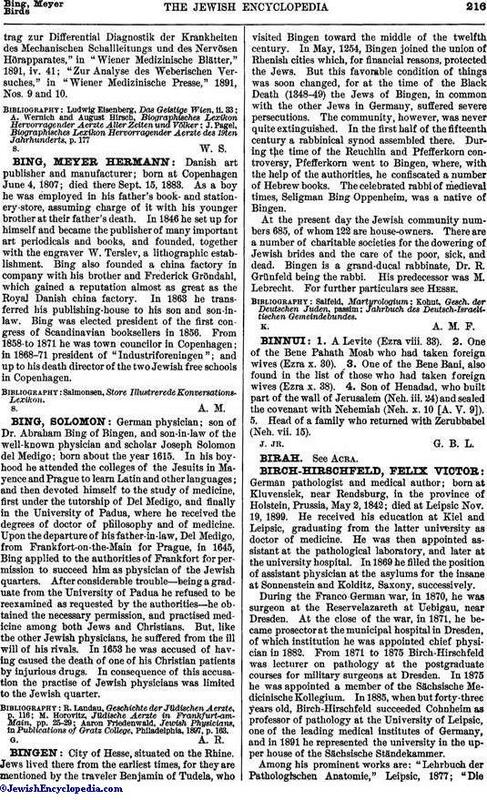 In 1871 he was appointed on the staff of the Vienna General Hospital with the title of adjunct physician. Bing held this position until 1873, when he became assistant to the famous otologists Politzer and Gruber in the newly erected clinic for diseases of the ear, remaining in this position three years. After a lapse of five years he was made privat-docent of otology at the University of Vienna. 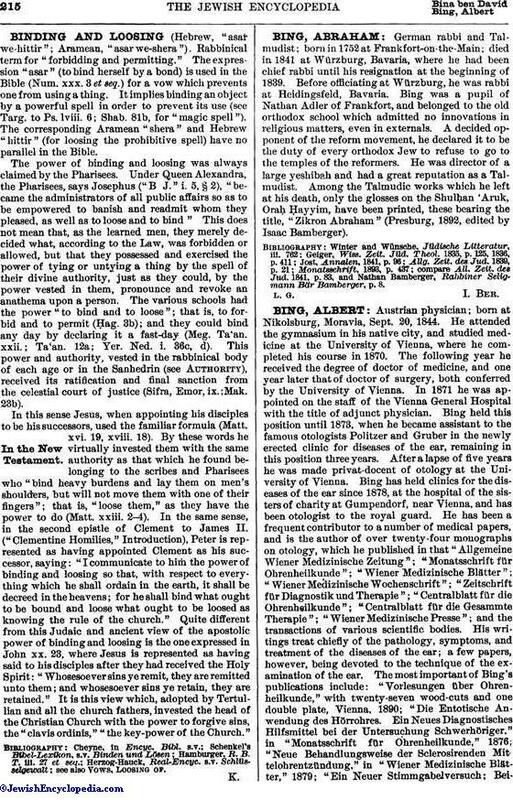 Bing has held clinics for the diseases of the ear since 1878, at the hospital of the sisters of charity at Gumpendorf, near Vienna, and has been otologist to the royal guard. He has been a frequent contributor to a number of medical papers, and is the author of over twenty-four monographs on otology, which he published in that "Allgemeine Wiener Medizinische Zeitung"; "Monatsschrift für Ohrenheilkunde"; "Wiener Medizinische Blätter"; "Wiener Medizinische Wochenschrift"; "Zeitschrift für Diagnostik und Therapie"; "Centralblatt für die Ohrenheilkunde"; "Centralblatt für die Gesammte Therapie"; "Wiener Medizinische Presse"; and the transactions of various scientific bodies. His writings treat chiefly of the pathology, symptoms, and treatment of the diseases of the ear; a few papers, however, being devoted to the technique of the examination of the ear. The most important of Bing's publications include: "Vorlesungen über Ohrenheilkunde," with twenty-seven wood-cuts and one double plate, Vienna, 1890; "Die Entotische Anwendung des Hörrohres. Ein Neues Diagnostisches Hilfsmittel bei der Untersuchung Schwerhöriger," in "Monatsschrift für Ohrenheilkunde," 1876; "Neue Behandlungsweise der Sclerosirenden Mittelohrentzündung," in "Wiener Medizinische Blätter," 1879; "Ein Neuer Stimmgabelversuch; Beitragzur Differential Diagnostik der Krankheiten des Mechanischen Schallleitungs und des Nervösen Hörapparates," in "Wiener Medizinische Blätter," 1891, iv. 41; "Zur Analyse des Weberischen Versuches," in "Wiener Medizinische Presse," 1891, Nos. 9 and 10.